I have always been wary of eggplants. In theory they are good; when cooked well they have a rich and smoky flavor that soaks up yummy aromas like garlic and olive oil. In practice, though, eggplants have caused me a lot of grief. I've tried roasting, but with dry and disappointing results. Frying isn't really my thing. 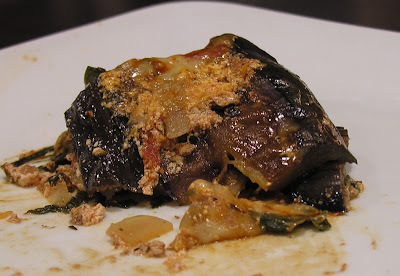 I've used the trick of roasting the entire eggplant in the oven, but, while tasty, the finished product is a heap of mushy nightshade, suitable only for baba ganoush or another similar dish (not that I have a problem with baba ganoush). Last night, though, I decided to tackle the infamous eggplant. My gameplan: cook it not once, but twice. If I couldn't get it soft and moist enough with one method, the second would surely do the trick. I was inspired to create this grilled and admittedly pseudo lasagna by the Griddler, a Cuisinart appliance that looks like a George Foreman grill on steroids. You can open the device to a 180-degree angle, allowing for a fairly large and grill-like cooking surface. My idea was to grill slices of eggplant and zucchini, and layer them with ricotta, tomatoes, and spinach. Thus the grilled lasagna was born. I started the dish by marinating the vegetables for a few hours in some oil, vinegar, and garlic. I then grilled them, making sure they got golden brown and soft. The zucchini was pretty self-explanatory, but the trick with the eggplant was to flip each slice several times, brushing them with leftover marinade to prevent them from getting too dry. Once grilled, the eggplant were still a little tough on the inside, but the baking completely cured that problem. The finished lasagna, though a bit watery (due to a lack of carbohydrate, I suspect), was flavorful and quite tasty - and even tastier the next day. The picture above is of a day-old piece, which sliced nicely. As you can see below, though, the finished product didn't hold up to a fork quite as well as a traditional lasagna might. In any case, this lasagna is chock-full of vegetables and is perfect with pasta or a thick slice of bakery bread. It would make a terrific sandwich, too - similar in structure to traditional eggplant parm, but without giant globs of cheese and greasy pools of oil left on your plate. A few tips: baby spinach obviates the need for chopping, which is always a plus. I always have success with small eggplants, like the Italian or baby varieties. Finally, splurge for the whole, peeled San Marzano tomatoes (sold at Whole Foods for $2.89 per can). They are unusually delicious, and big, juicy chunks of them add great texture to this dish (see below). Slice zucchini and eggplant lengthwise into thin slices; salt and pepper them. Pour marinade over vegetables, and let sit for about 2 hours. Heat a grill or grill pan, and grill vegetables, allowing them to get brown and soft. For eggplant, flip several times, brushing with marinade with each flip. Heat oil in a medium saucepan and add onions and garlic. Season and saute until soft. Add spinach and continue to cook until wilted and water has evaporated. Add chopped tomatoes and cheese, stirring and cooking until combined. Adjust seasonings and remove from heat. 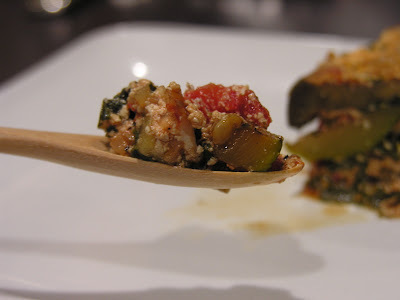 Spread a few tablespoons of sauce in the bottom of a small rectangular or circular glass dish. 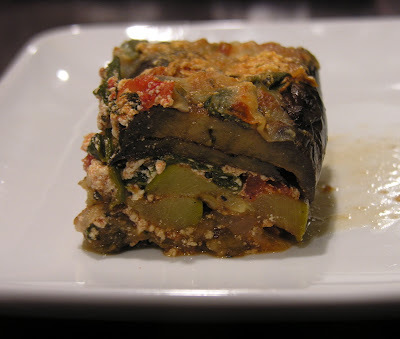 Begin layering vegetables, placing a layer of eggplant, then more sauce, then a layer of zucchini, and so on until vegetables and sauce are used up. Top final layer with mozzarella and parmesan, and bake at 350 degrees for 30-4o minutes. If top is browning too quickly, cover with foil. Finish under the broiler for about 3 minutes, until cheese is browned and bubbly. Lasagna is best served the next day, as the chilling helps it set nicely. you can fin a lot of italian web sites in english version of italian arts.